Ooooh, the exciting part is painting an oil wash foundation over the old, mediocre painting. 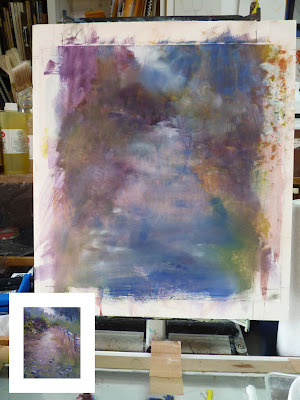 This image shows the oil wash foundation for a new painting, "Stony Path." 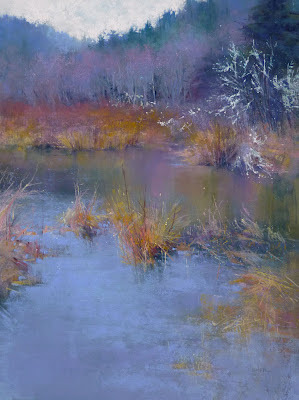 In the lower left corner is the little color study for sale at auction on DPW. Auction will end Tuesday, April 3. 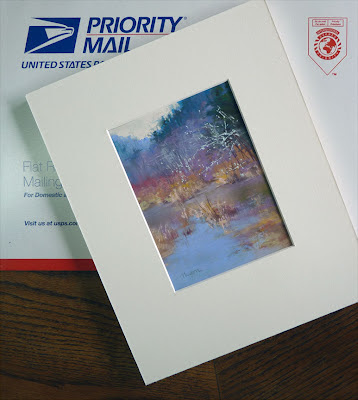 Creating a small (5.75 x 4.5 inches) color study has really helped me to stay focused regarding color choices. When I am "lost" I keep pulling out additional colors. Once I counted over 50 pastels to clean and put back after finishing a painting. Maybe some people work this way and love it but it feels to me as if I am out of control as I grab another color thinking that one might "do the trick." 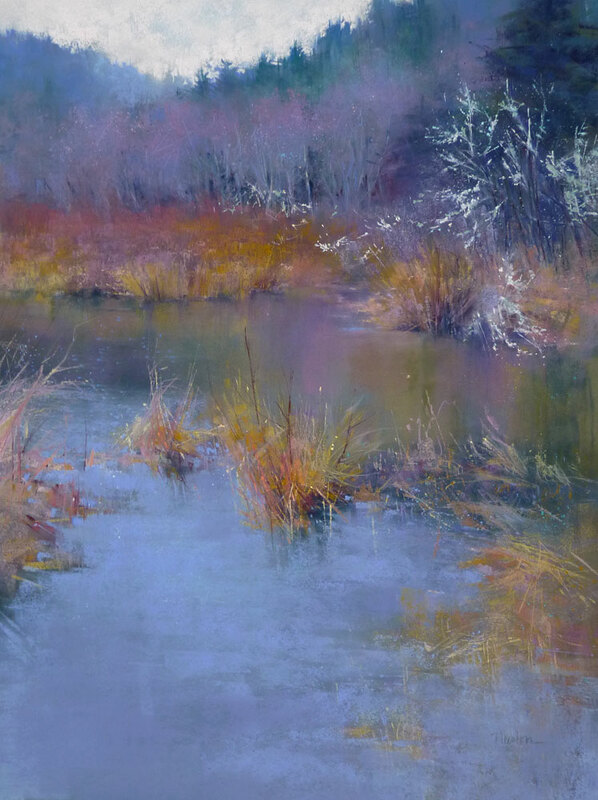 I would rather have 50 pastels out during the small color study process. When I am working on the larger painting, with most color decisions made previously, I can concentrate on finesse. Let me start today's post by saying I successfully boiled eggs today with the help of two timers! Thanks to all of you who emailed or posted to let me know I'm not alone re my distraction problem. 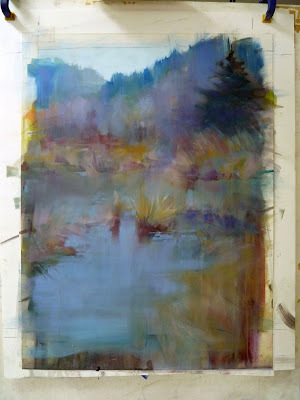 Another painting to rework; I started with a graphite sketch on Wallis that had a watercolor splash already on it (same piece as in my March 16th post) for the little color study for a larger work. Watch for this 5.75 x 4.5 study on the Daily Paintworks Auction for $20. 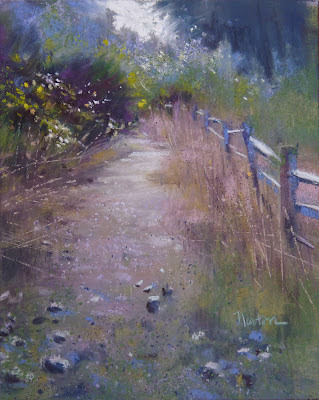 The larger painting will be 14.25 x 11.5 inches and is tentatively titled "Stony Path." I am done! 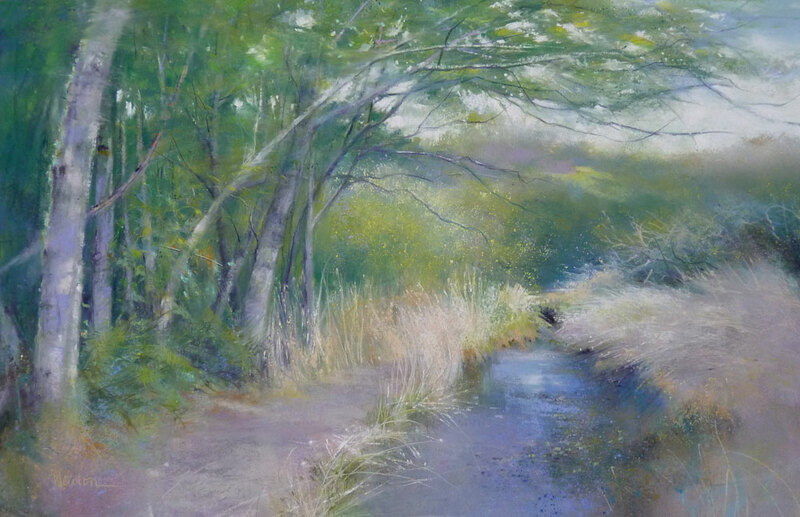 Painting a scene with lots of green while in the season of disappointment (known elsewhere as spring) seemed to be a challenge for me. I kept the little color study beside me to stay on track. Good thing I finished this painting last night because the color study will ship to the Daily Paintworks winning bidder today! Warning! Do not put a dozen eggs on the stove to boil thinking you can just duck into the studio for a minute to evaluate what needs to be resolved in a painting. I thought I would just touch up an area or two and was totally in my painting zone until the dry eggs started exploding in the kitchen. Saddest part is that they were beautiful brown organic eggs. Boo hoo. For my project, "mediocre paintings reworked into excellence" (20 to go after this one), once the little color study is complete I start on the larger work. 1. 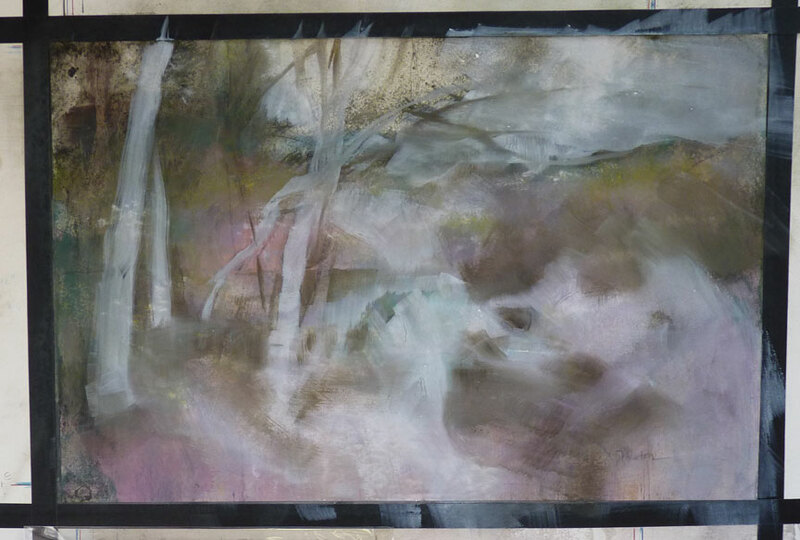 I unframed the painting and hosed off the mediocre work (on Wallis paper so it can take water). I pat it dry with a cloth towel. 2. I squeezed out white and raw umber oil paint onto my glass palette. With a 1" wide brush and odorless mineral spirits, I applied an oil wash foundation (see photo below). 3. I let it dry overnight. 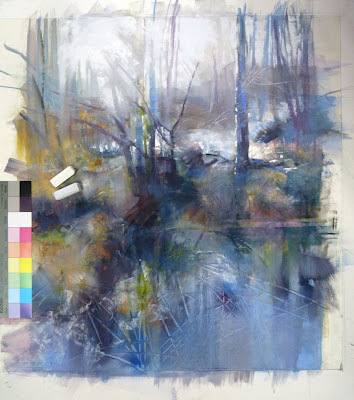 This morning, with the little color study beside me, I applied white, warm dk gray and dk blue NuPastels. Any other color you see is the "ghost" from the mediocre work I washed off. Here is the larger work, 19 x 14.5 inches, titled "Rain Dance" because when I took the reference photo a few years ago, there was a light pattern of rain on the water. Maybe you can see my indication of it in the darkest water area on the left side if you click on the image to enlarge it. The hardest part was the bright, pale lichen. I took clues from the little study I did. It needed to be light and airy as in the little study but more detailed for this larger work. I think I did it. 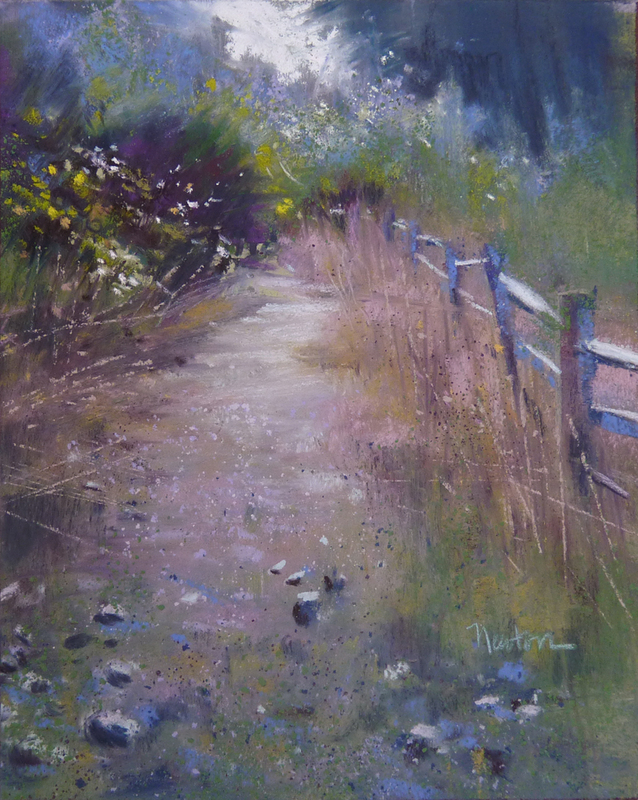 Tomorrow I will mail this study for a larger work to the winning bidder! 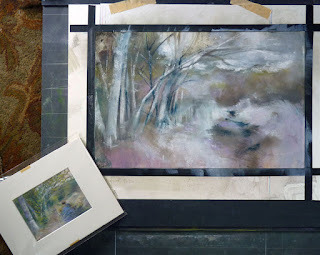 I'm working on the 4.5 x 5.75 inch color/composition study for my next painting. 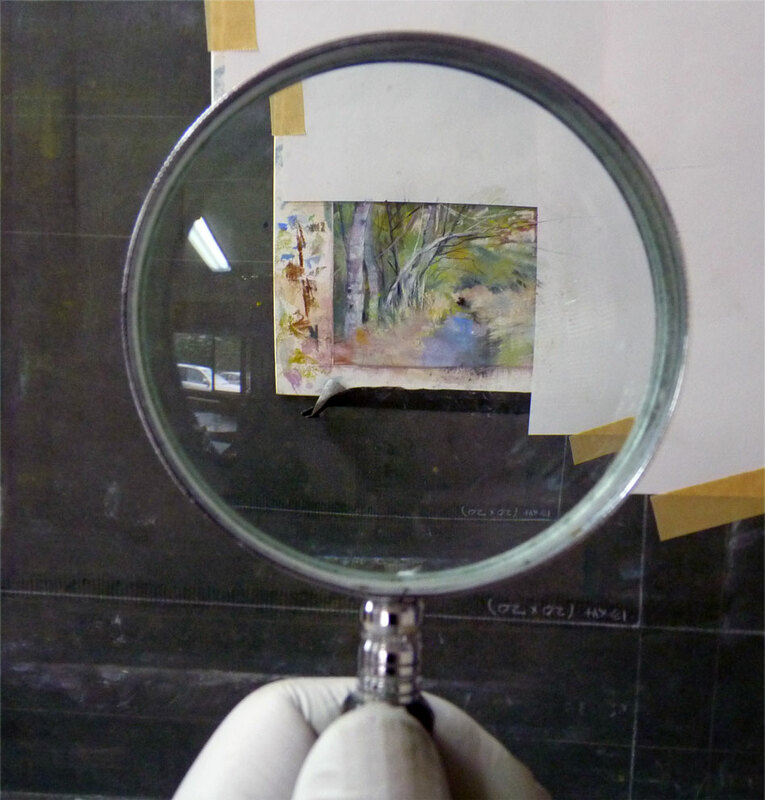 Even though it is small, it helps to do occasional checks with a reducing glass to tighten it up and see it as a thumbnail. Watch for this little study on Daily Paintworks. Those of you who follow this blog know that I am reworking 23 mediocre paintings. I just finished #22 and will post it soon. Now, on to #21. I'll start with a 4.5 x 6 inch color study. 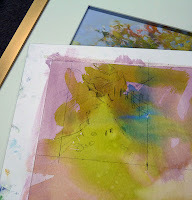 In my flat file, I found a sheet of Wallis paper with a splashy watercolor foundation. The Wallis is mounted onto 4-ply archival mat. 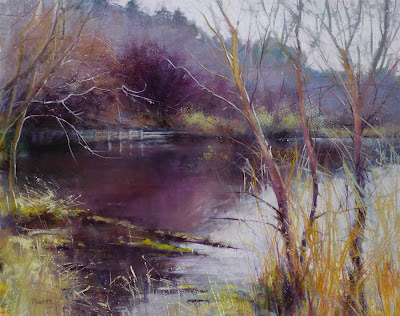 I penciled in the boundaries for the little study and indicated the composition. Starting a new painting is always an exciting, hopeful time! Several times during the painting of a new scene, I put a mat around my work to cut out all the marks that will not show when it is framed. I'm about 80% done with this one. The shape of the foreground water needs correcting, the lichens are only indicated....basically the right side needs resolution. 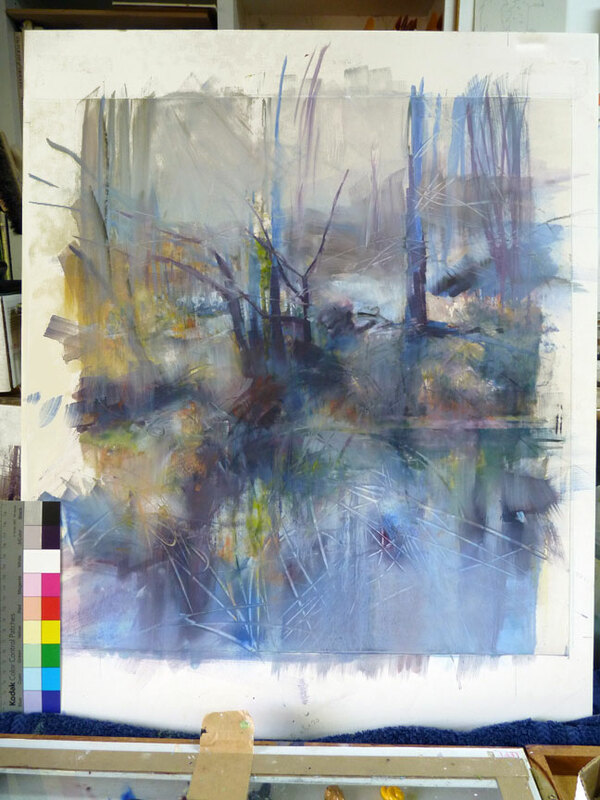 The little color study I did prior to starting this larger work is a big help in deciding not only color but also keeps me on track from getting too immersed in detail. 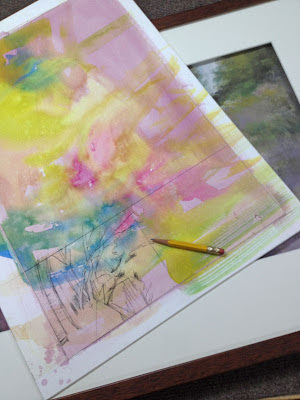 I've received emails appreciating the step x steps I post on this journal so I'll try to do that with this painting. I'm working from the top down and using the little color study as my example - applying pastel on top of the oil-wash foundation shown in my last post. Each time I introduce a new color into the painting, I apply it in several places. 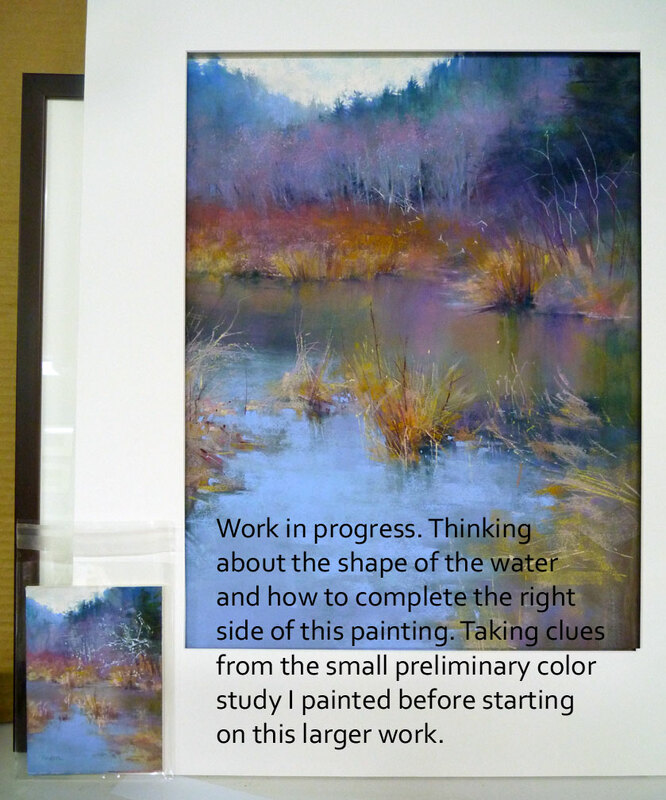 Example: The light blue of the distant hills is repeated in the background trees and in the brightest area of the water. I feel this adds continuity in a painting. It is very distracting to me to view art that has a spot of color in one place without being able to find that color in a least one other area. After completing the itsy-bitsy color study (see my previous post) for this painting, I unframed Mediocre Painting #23, brushed the pastel off and applied an oil-wash foundation to the Wallis paper. The size on the finished painting will be 19 x 14.5 even though I have extra paper around the edges and could make it larger. One of the goals of these 23 reworks is to pop the new work right back into the existing mat and frame. If I took advantage of the larger surface, I'd have to purchase a new frame and add the empty frame and mat to my inventory of frames which is more than adequate already. 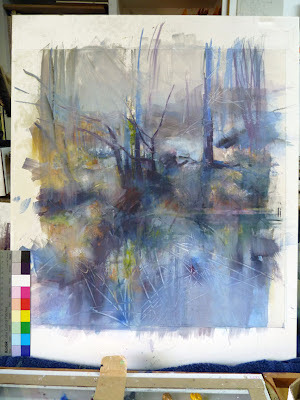 This is an itsy-bitsy study to work out the colors for a larger painting. It is 5.75 x 4.125 inches and is on Daily Paintworks Auction starting at $20. I don't know how I got into this branch thing. Well, yes I do, it started with my painting "Winter" a few weeks ago. Suddenly, as never before, I wanted to paint trees without leaves. This is another view of the Golden Gardens Park pond in Seattle. And, it is painted over an old painting. From my art database, I separated out the paintings that I considered mediocre. That gave me a new database with 24 images to be reworked. Now I have 23 to go. Four years ago I named a painting Edge of Winter. After a couple group shows it went to one of my galleries and stayed there until I picked it up a couple weeks ago. You know what happened next...I washed it off and repainted this winter scene from a photo taken on a dog-walk with Annie and my two grandsons. This summer, a good crop of blackberries will be where last year's vines are now. 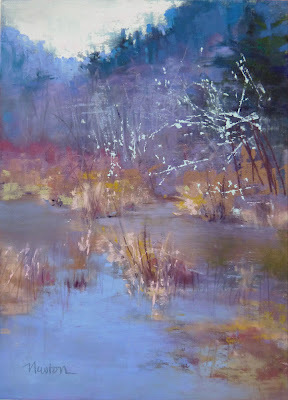 This painting is titled Edge of Winter II. To begin applying pastel over the oil-wash foundation, I selected two "white" pastels - one cool and one warm. The cool white was applied for the sky everywhere except the upper left quarter where the light source (sun) was shining down upon this woodland scene. For that area, I applied the warm white. 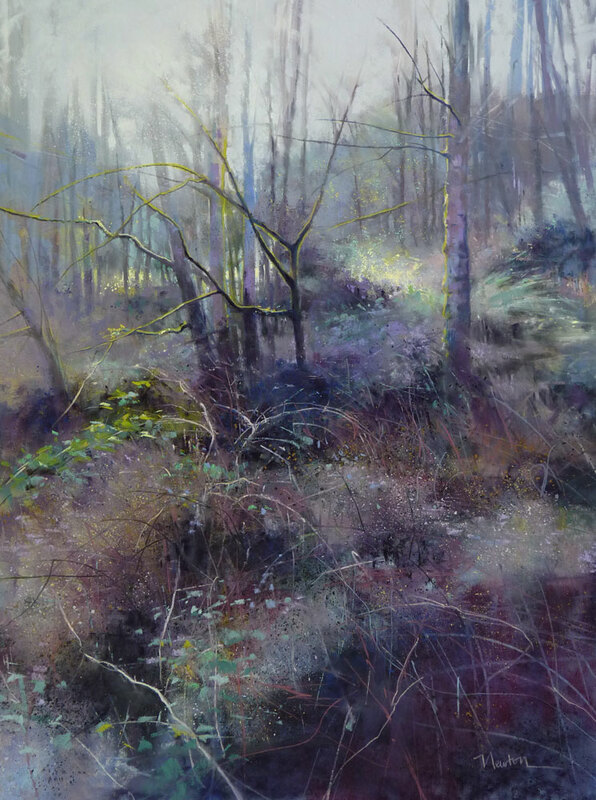 I also used the warm white for glow on the edge of the tree at right and lightest foliage areas. Click on the image to enlarge. These are Terry Ludwig whites - love them! On another subject, blog subscriber Karen asked if I could explain the Kodak Color Separation Guide and Gray Scale sometimes included in my work-in-progress shots. When I photograph my work, I always include this for color reference. If the color bar doesn't look right, I know the color of the art is off. Here's the blurb from Kodak: "... Separation Guides are used as the set up guide to calibrate several digital color print systems. In addition, helps photographers compare the color of the subject with known printing colors. Also helps Graphic Arts camera operators identify separation negatives and positives for color reproduction processes. " 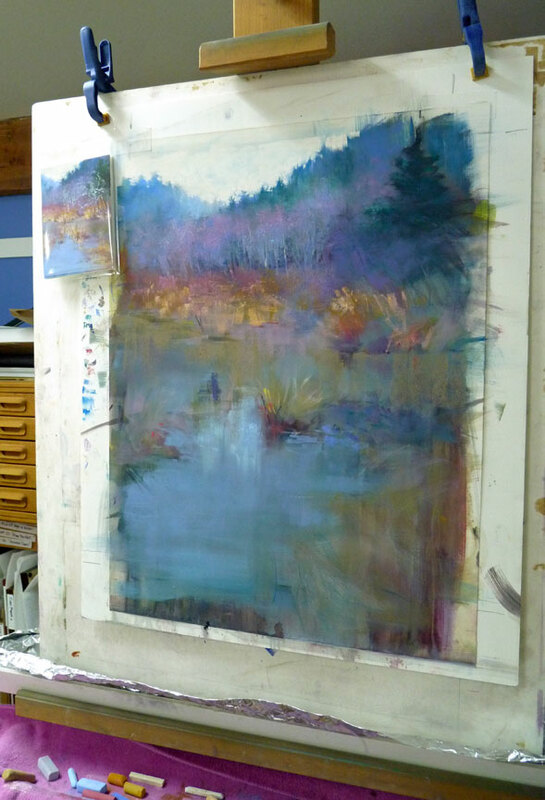 This is the oil-wash foundation on Wallis sanded paper for my next Pacific Northwest woodland scene.